But the idea of my Sardinian home was just too tempting, so I decided to at least give the book a try. I started with something simple: polenta with sausage and tomato sauce. While it was absolutely delicious and quick, it was close to something I might throw together when accidentally coming across a forgotten bag of polenta in my cupboard. Next I tried the pasta with lamb and fava beans, which came together very quickly. 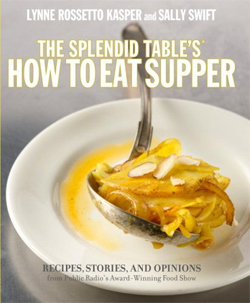 In about 20 minutes (not counting the time spent in front of the television, mindlessly shelling the fava beans) I was eating, and it was wonderful. 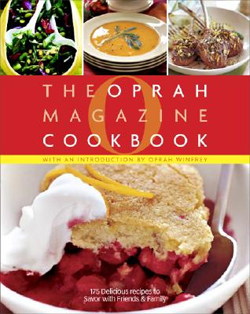 I wanted to expand my horizons, but even the recipes’ borderline items alluded me. I knew I could probably find octopus at the fish market up north, but that would require a 45-minute bus ride in the Chicago summer. Not even the fishmonger closest to my house could help me track down fresh sardines or cuttlefish ink. 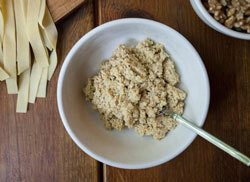 That left a few pasta dishes, salads, and desserts that could be made with ingredients at the market. Well, there was also the suckling pig — a butcher near my house has a large banner outside its window declaring SUCKLING PIG HERE, so finding one wouldn’t be a challenge. But then I thought about my friends walking in and being greeted with its tiny, adorable, roasted face: I would never convince anyone to come over for dinner ever again. 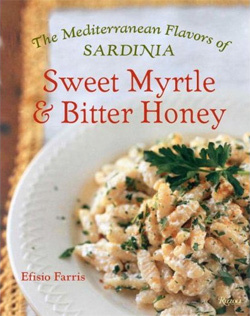 Many of the recipes called for saba, which Farris explains thusly: “Sardinia shares with the mainland the ancient, meticulous craft of reducing grape must (or unfermented grape juice) in large copper pots into rich, not-too-sweet liquid called mosto d’uva… or [reduced] even further (with the addiction of sugar and sometimes orange or lemon rinds) into syrup called saba.” “I can totally fake this,” I thought. I opened a bottle of Italian wine and started reducing it. I considered running to the store for unfermented grape juice, but I doubted the Sardinians are using jammy Concord grapes in their sauces. I added sugar and both lemon and orange rinds because I imagined I would need extra flavor to mask whatever I was screwing up. I got it down to a syrup consistency and decided to try the pork tenderloin with saba. Other saba-based recipes looked better, but this was so low maintenance, I figured that if it were a disaster, I would only lose an hour of my life. Disaster, no. Life changing, also a no. I’m sure if I had used real saba, it would have been transcendent, but as it was, it was a pretty good pork dish. Heat oven to 400 degrees and roast sausage until brown, turning once. Slice into 1/4-inch slices. Lower temperature to 350 degrees. Heat olive oil in a skillet over medium heat and add onion. Saute until golden, then add sausage. Heat until brown. Add the wine and deglaze the pan. Add tomato sauce and reduce heat. Simmer, stirring often. In a large pot, bring 5 cups of water to boil. Slowly whisk in polenta. Whisk until creamy, about two minutes, and add salt. 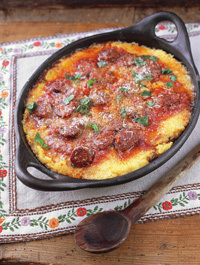 In a 2-quart dish, spread half of the polenta and add half of the sausage tomato mixture on top. Top with half of the grated cheese. Repeat each layer. Bake in oven for 10 minutes. Sprinkle with basil and drizzle with olive oil. In a large saucepan, warm olive oil, garlic, and bay leaf over medium heat. Add canned tomatoes and their sauce, smashing the tomatoes with a fork or the back of your spoon. Add the rest of the ingredients. Bring to boil, then reduce heat and let simmer for 25 minutes. Stir frequently. Remove bay leaf, celery, and carrot. Serve.